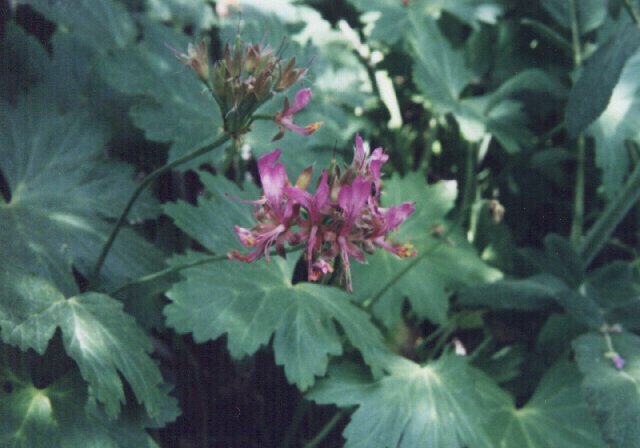 In the late 1990’s, Pelargonium endlicherianum and Pelargonium quercetorum successfully crossed in my garden in Los Lunas, New Mexico, USA. A single offspring was produced, the result of a fortuitous but planned attempt to produce a plant more tolerant of the climatic conditions in my garden than either parent had proved to be. The offspring came to seem so remarkable to me that I named it Pelargonium ‘Kavushan’ from the Turkish, meaning ‘coming together after a long absence’ in recognition of what must be an ages-old separation of the parent species in nature. I do not know if P. ‘Kavushan’ marks the first time these species have been crossed, but searches of Geraniaceae and other botanical literature to date have found no evidence of such a cross either in cultivation or in the wild. The parent species are hardly well known garden plants, though the former will be recognized by some rock garden enthusiasts. 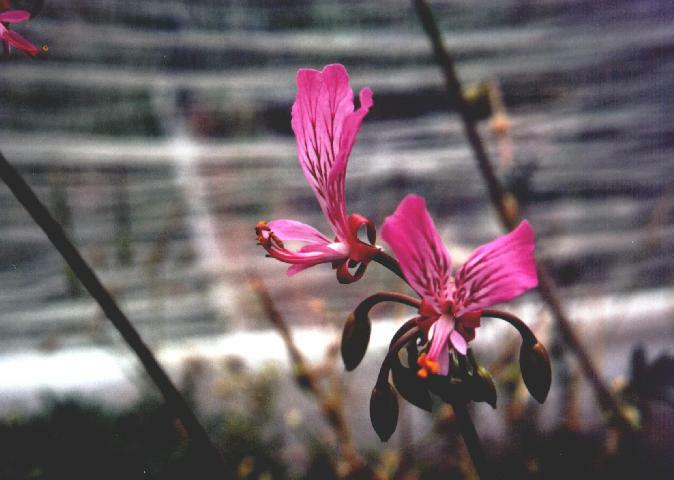 Even in strictly Geraniaceae circles if they have any fame it is probably for two reasons: first, their chromosomal complement of 34n is unusual, even rare, in the genus, and second, because they are known as the “hardy” Pelargoniums, i.e., “cold hardy,” in a genus of chiefly tender species. 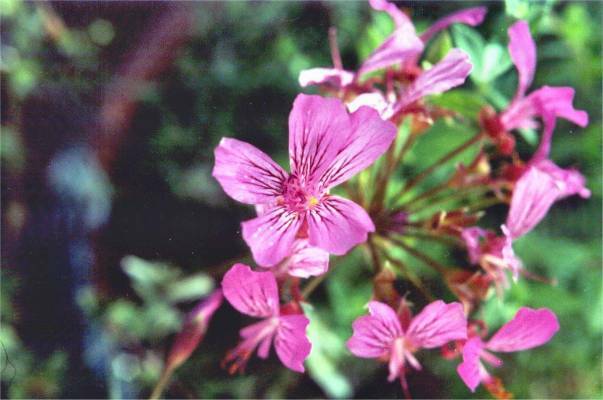 They are, in fact, the only known Pelargoniums native to the northern hemisphere temperate zone – and cold areas at that. P. endlicherianum is widely distributed in the highlands and mountains of Turkey while P. quercetorum inhabits a much smaller area centered on the triangular mountainous region where Turkey, Iraq, and Iran meet. Their areas of distribution are not contiguous; to date, the nearest the species have been found to each other is at a distance of about about 280 km/175 miles apart. This makes the likelihood of a natural hybrid seem rather remote. Their close relationship is apparent only when they put out their very showy annual flowering stems, which are nearly identical, otherwise the plants do not resemble one another. The climatic conditions in my garden can be daunting for many non-native plants, especially for those that do not have a broad ecological tolerance or even if they do have that, also have a quirk or two that simply cannot be overcome in my locality. The garden is located at 1,479 m at the northernmost tip of the Chihuahuan Desert in central New Mexico. The most striking aspects of the climate in this specific locality are intense sunlight year around, extreme aridity (yearly rainfall of 200-250 mm); summer heat (July daytime high averages 33 C); a schizophrenic winter (January nights average -8 C while daytimes average +10 C); and violent spring windstorms. Frost can be expected from the 2nd week in October to the 2nd week in May. Since 1990, I have recorded temperature extremes of -22 C and +40 C in the garden. In contrast, the habitats of P. endlicherianum and P. quercetorum have yearly rainfalls ranging from almost twice to five times the amount of Los Lunas. Summers are warm and, in the case of P. quercetorum, quite hot due to infiltrating heat from the Iraqi desert. But the most significant weather condition in their habitats is the cold and snowy winter. And each species reacts to freezing weather in its own way. P. quercetorum, like many cold-hardy perennials, goes dormant with resting buds at or just below ground level when autumnal frosts began to presage the advent of cold weather. It remains dormant until spring, even through warm spells in winter against which it is probably protected by the deep snow prevalent in its region. P. endlicherianum, on the other hand, has a different strategy: with the first autumn frosts this species does not lose all its basal foliage; leaves retained become thick and rugose, and will remain on the plant throughout the winter unless the air temperature drops below -13 C, at which point the plant drops all its leaves. But the crucial point with this species is that it is dormant only so long as the ambient temperature remains below the point at which vegetative growth is suspended – about 5 C – or at least does not rise and stay above that temperature long enough to induce the plant to break dormancy. In parts of its range, winter cold is not always accompanied by reliable snow cover. 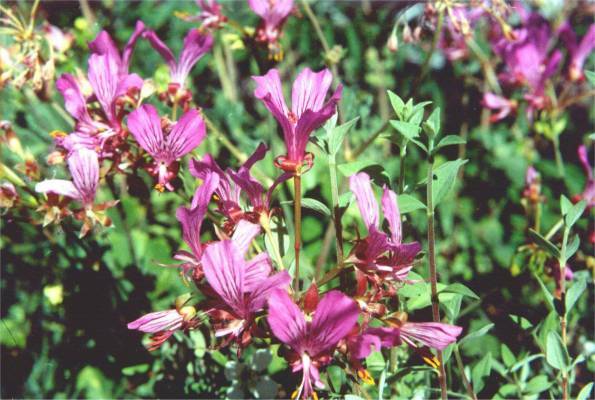 Both species are long-lived in the wild and under the right conditions can be in cultivation as well. Conditions in Los Lunas seemed not to affect P. quercetorum’s longevity, but the longest a plant of P. endlicherianum had endured was three years. 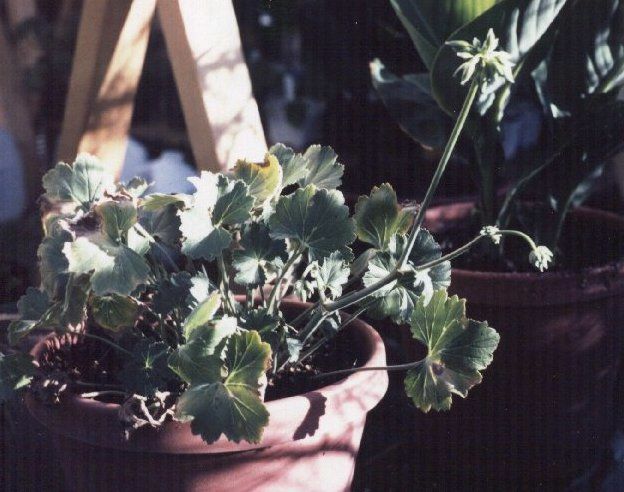 P. endlicherianum, despite having possibly the strangest distribution of all Pelargoniums in that it fits itself into widely disparate ecological niches, still has several quirks that make it unsuitable for the Los Lunas garden, namely intolerance toward winter daytime warmth, i.e., the lack of unbroken cold spells for the duration that P. endlicherianum needs to complete its dormancy requirement, and excessively high summertime heat. P. quercetorum does seem to have a fairly broad ecological tolerance and grows well in the Los Lunas garden, but early spring temperatures are too mild and there is no snow cover to inhibit breaking of dormancy until the danger from late frosts is past. The plant rarely flowers and when it does, the flowers are often ruined by the late frosts. P. endlicherianum, by contrast, flowers later and is rarely affected by late frosts. It was, in fact, the parent species themselves that suggested the cross. In trying to grow them over the years, and with only moderate success, I had nevertheless observed that each exhibited a trait or two amenable to the local conditions. Thus, if the two species could be crossed and an offspring obtained with these particular traits from both parents made dominant, it might well prove to be the plant for my garden. This indeed was the case. P. ‘Kavushan’ takes its basic appearance from P. endlicherianum, though it is a larger plant – the increase in size may come from P. quercetorum. Like both parents, it is quite cold hardy. It’s method of dormancy is inherited from P. quercetorum and hence it has no problem with warm spells in winter. It also appears to have inherited heat tolerance from P. quercetorum and does well in full sun or partial shade. Like P. endlicherianum, it flowers from late spring into July, and even more profusely than that parent. 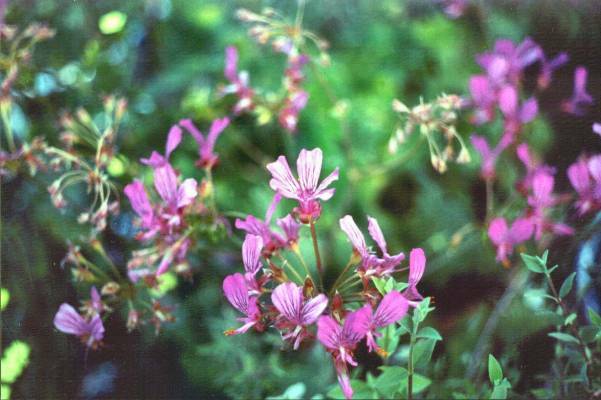 The following photographic report is about the anomalous flower observed on P. ‘Kavushan’ (July 2002). 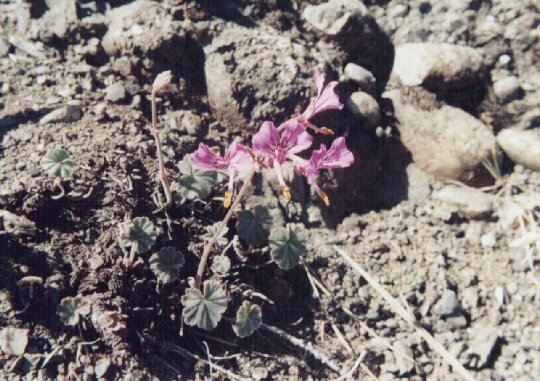 See also Pelargonium endlicherianum in habitat (Taurus Mts, Turkey).